'Tis the season for new LEGO books. I've got a stack of new LEGO books to review, so over the next couple of weeks I'll be posting these reviews every couple of days. 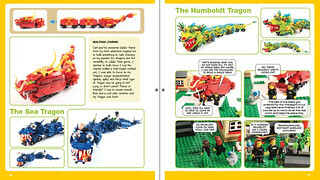 Last year, Megan Rothrock's LEGO Adventure book was among those that received my highest praise, and I'm so happy that she has continued her series with a second volume (and the book ends with "The adventure continues...", so we're promised at least a third volume, presumably this time next year). This book is very much in the same style as last year's volume. Meg's sig-fig travels around, meeting AFOLs from around the world, and along the way we get to see their great builds and get instructions and tips as to how to build our own versions. 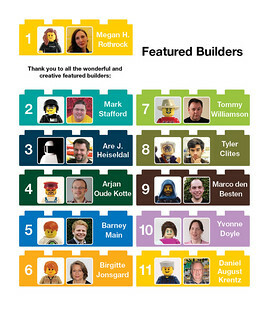 Once again, Meg has assembled a great line-up of builders - three repeats from last year, and seven newcomers. 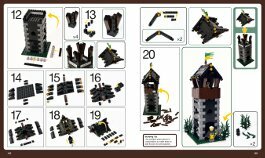 Specifically she includes builds by herself, Mark Stafford, Are Heiseldal, Arjan Oude Kotte, Barney Main, Birgitte Jonsgard, Tommy Williamson, Tyler Clites, Marco den Besten, Yvonne Doyle, and retired LEGO designer (and the guy who designed the Yellow Castle!) Daniel August Krentz. Building styles include space, pirate, town, Friends, micro, post-apoc, among others. I did see some differences between volume 1 and volume 2. It seems that the building directions are more detailed in this volume, which is nice. 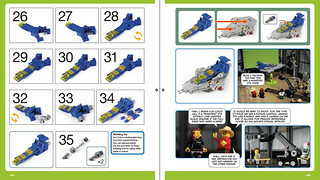 All of the builds have lists of what bricks you will need, which were missing from some of the directions in volume 1. 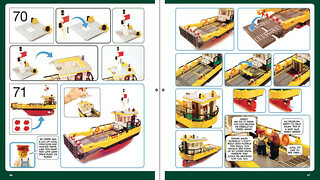 There are fewer builders for the same number of pages, and I think this can be explained by the greater number of pages devoted to detailed building instructions, and also more additional models for those builders who were included. Also, this book has more of a story than volume 1. In the previous book Meg was simply visiting other builders. Here she is ch]]asing the "Destructor" through these different LEGO lands. Whereever he goes, the Destructor destroys MOCs. This, then, gives Meg's sig fig the opportunity to help rebuild them. It's a nice device that then gives the excuse to include building instructions as part of the narrative. One suggestion would be to have shown the original MOCs before the Destructor came along, and then show the rebuilding. Since in a couple of places they note that the rebuild was not exactly the same as the original, this might be a good way to show that you can use LEGO to build in different ways. I liked that there was some inclusion of microscale, though the one model was still in a fig-scale world as a movie prop. As I noted in my review of volume 1, this series is a celebration of the AFOL community. There are some nice inclusions that you pick up on if you know the community references or the people involved. For instance, Meg and Mark come across as partners in the book, reflecting their real-life relationship. Meg also includes a MOC of their dog, Bandit, who passed away this year (probably after the book went to print, now that I think of it). Tommy's MOCs are based around a movie set, reflecting his real-life profession. 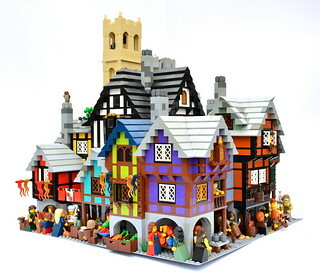 We get a reference to the Guilds of Historica project on Eurobricks. I was wondering if the reference to the CCC, the Council of Creative Constructionists, was a veiled reference to the Colossal Castle Contest or just a coincidence of acronyms. Other nods include the inclusion of post-apoc as a fan theme, a reference to online contests, and a micro rendition of the fan-favorite Galaxy Explorer. The community reference that most warmed my heart, though, was the inclusion of Vic Vipers. I know that Mark has previously worked a reference to the late Nnenn into an official set, and it was great to see these included, particularly in a book that came out during Novvember. I love these little peeks into the AFOL community, which are still subtle enough that people from outside the community can equally enjoy the book without feeling somehow out of the loop. 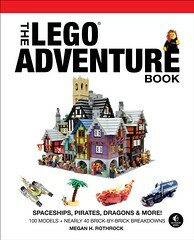 As with volume 1, I would give my highest recommendation for LEGO Adventure Book, Volume 2. The audience could range from a kid on up to a long-time AFOL; model difficulties range from intermediate to challenging; the variety of themes will have something for everyone. I'm very much looking forward to volume 3. One suggestion, if Meg happens to read this, is that in future volumes we should see Western and Ancient, two building areas that haven't been covered yet, and also some more exploration of scale, such as additional micro building and also things like miniland scale. I'd also love to see some licensed themes (Star Wars, DC, Marvel, Tolkien), but I completely understand how that might run into additional IP headaches when producing a book like this. Birgitte Jonsgard's Snugburg graces the cover, and there are many detail shots inside. This was the inspiration for this year's medieval town category in the CCC, for which this book is the prize. 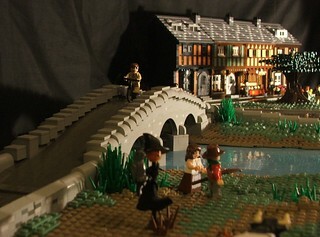 Wow, that bridge and medieval town looks amazing! Thanks for sharing Bruce! Just the picture on the cover alone has me almost sold on this book.